The Red Dead revolver challenge is well worth the time, both for the easy money and the gun. In December, GTA Online added a Red Dead Redemption 2-themed challenge, which was nice, even if the game it's promoting has not yet been announced for PC. The quest is well worth doing—not just for the cool, deadly revolver it gets you in GTA or the exclusive gun skin it gets you for Red Dead, but mainly for the $250,000 you get for completing the ensuing headshot challenge. 50 headshots of any NPC gets you the money. It took me less than 40 minutes. 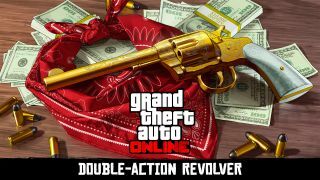 VIDEO: How to get the revolver in GTA Online, as detailed by our pals at GamesRadar. Secondly, for lapsed GTA Online players who fancy a quick cash injection, this is extremely good value for the time demanded in my opinion—you can treat it like a singleplayer mission. $250,000 in air deliveries from my hangar would probably take me at least twice as long to earn, and require the help of another player. This challenge, though, you can do alone. In Shark Card terms, this amount of money is more than you get for the second lowest tier, which is $200,000 for £3.19/$5. So, yes, this is just a quick reminder in case you missed it. The quest itself is pretty fun to do solo, too—I actually wish GTA had more mystery-led missions after playing through it. Then I realised what I really wanted was to play another Red Dead, where the side content leans more towards exploration and discovery.